A dog doesn’t have to be as big as a St. Bernard to make a difference in wartime. 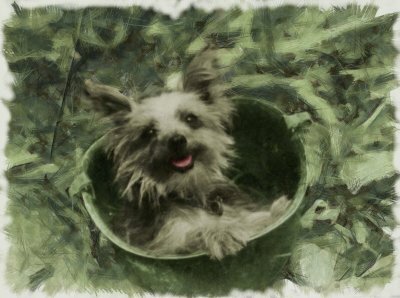 During World War II, Smoky, a small Yorkshire Terrier was found down a foxhole in New Guinea. It seems amazing that such a small breed, that had largely become unfashionable by this time, would be stray in the jungles of New Guinea! The soliders who first found Smoky believed that she must have belonged to the Japanese. This idea was quickly discounted when it become clear that she didn’t understand Japanese or English. One of the soliders that found Smoky, needing money to fund a poker game, sold Smoky to Corporal William A Wynne for two Australian Dollars. This must have been the best spent $2 by Corporal Wynne. Throughout the rest of the war, Smoky was Wynne’s constant companion on treks through inhospitable terrain and stifling weather conditions. She even accompanied Wynne on a dozen air combat or reconnaissance missions in the Pacific. At one point, Smoky even parachuted 30ft from a tree, using a parachute made especially for her. She saved lives on many occassions warning the troop of incoming air attacks before anyone else could hear a thing. On one occassion, Smoky guided Wynne away from a particular spot on the ship’s deck – moments later a shell hit that section, killing eight fellow servicemen. The simple role that Smoky played in this could not be underestimated – the runway, piping and surrounding area would have had to been dug up, has Smoky not succeeded. This would have required many hundreds of servicemen, engineers and other ground crew to be vulnerable from enemy bombings, not to mention the number of reconnaissance planes necessary to try and keep the area safe. It was estimated that the work would have taken anything to to three days – a task Smoky accomplished in just a few minutes. Despite her clear importance and value to the soldiers, Smoky wasn’t an ‘official’ war dog, and so didn’t qualify for her own rations. Corporal Wynne would share his rations with her, and even made her a special blanket from some green card table felt. Her talents didn’t end there. Smoky also performed a role as what is to be believed as the first official ‘therapy dog’. Still in New Guinea, she accompanied nurses to try and lift the spirits of casualties from the Biak Island invasion. Smoky was already well known, which ensured her special status. She performed this role for 12 years, long after the war ended. After the end of the war, Smoky became something of a celebrity, appearing over 40 times on American television performing tricks, and entertaining millions of viewers. After a long career of danger, and finally adoration of millions, Smoky passed away in 1957 at the approximate age of 14. On November the 11th 2005, a bronze life size statue of Smoky was unveiled at the Rocky River Reservation, Lakewood, Ohio – her final resting place. The statue depicts Smoky wearing a GI helmet. The monument is dedicated to “Smoky, the Yorkie Doodle Dandy, and the Dogs of All Wars”. 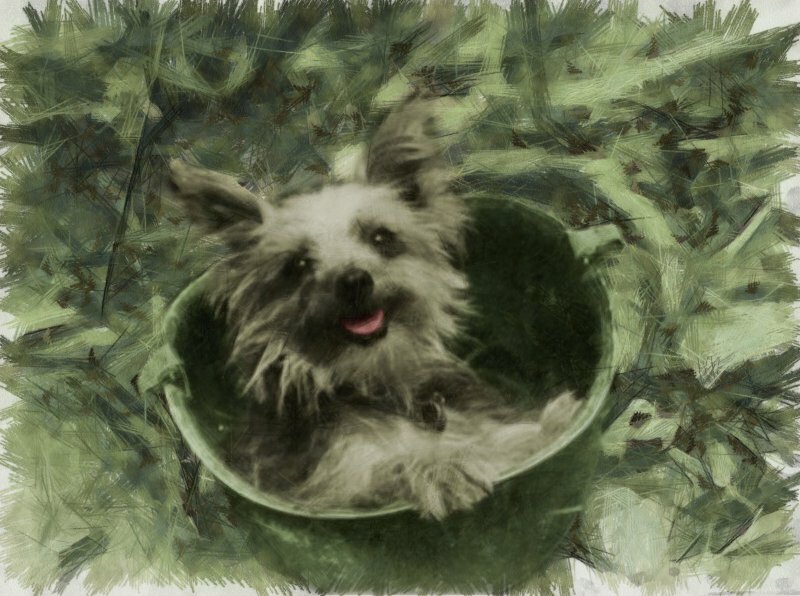 Smoky was beloved far and wide, and there are no less than six memorials to this brave little Yorkie in the United States alone. Artwork based on a picture Copyright 2014, William A Wynne, Used by Kind Permission. What a wonderful inspiring brave little dog. A story that brings tears to the eyes.